Vermont Maple Festival in St. Albans, Vermont now in it's 52nd year! Hailed as one of the “Top 10 Time Honored Events of Vermont” by the Vermont Chamber of Commerce comes the annual Vermont Maple Festival! 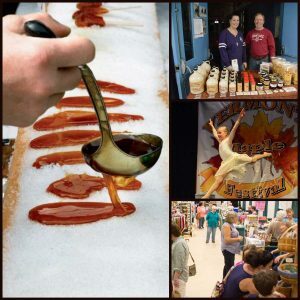 The Vermont Maple Festival begins Friday, April 27 and ends Sunday, April 29 in St. Albans, Vermont, only 40 short minutes from Sterling Ridge Resort. The theme of this year’s Maple Festival is “Life is Sweet” – something near and dear to the hearts of everyone at Sterling Ridge! Some of the most popular events are a Vermont Maple Beverage Tasting (21 and over) at 14th Star Brewing on Saturday (April 28) from 12 noon to 5 PM. Each beverage is made with maple syrup – YUM! For the kids, or for the young at heart, there is also a carnival all weekend at the District Courthouse parking lot and face painting on Saturday at Exhibit Hall, Craft Show, and BFA Performing Arts Center. For the hungry and breakfast-obsessed, a delicious pancake breakfast at the St. Albans City Elementary School, Saturday and Sunday morning from 7 AM to noon. Proceeds help the Martha’s Kitchen of St. Albans Vermont. A feel-good breakfast with a feel-good charity donation of $8 for adults. More details on the Vermont Maple Festival’s website (available at the end of this post). Fan of the Vermont arts? Try your hand at painting Vermont scenery on maple sap buckets! The event “Maple Paint and Pint” brings together Vermonters favorite things. $35 ticket includes a glass of maple beer or wine, painting materials, and fun! 6-8 PM, limited seating. Taylor Park Tent has several shows throughout the weekend festivities, including Sterling Ridge favorite Rockin’ Ron the Friendly Pirate, a Jeffersonville local with punny pirate songs to entertain the whole family! Rockin’ Ron’s performance is on Saturday at 12:45 in the Taylor Park Tent. You won’t want to miss it! Other popular events include an antique show, a Variety Show, a Craft and Food Show, the Saint Albans Museum, and chainsaw art by Mark LeClair. All of these events will be going on throughout the weekend. Don’t forget to come hungry! The Vermont Maple Festival has wonderful food vendors from around the state to satisfy the hungriest families! It’s not a festival without fried food! For directions, there is a map on the main page of the website,maple syrup. There, you can find details on all events, food, and activities. Sterling Ridge guests staying here that weekend can be helped by our front desk staff for the “must-sees” of the Maple Festival.